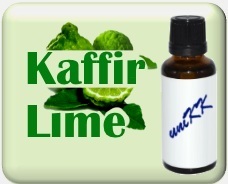 Kaffir Lime Essential Oil - Pure! Also helpful with respiratory infections, which may include breathing difficulties. Excellent for using with the hair-care products in order to reduce hair falling and healing scalp. Strong sunlight to be avoided after use as it increases photo-sensitivity of the skin. Blend well with Cypress, Eucalyptus and Lavender.